In March 2001, singer-songwriter Leslie Benson founded Burning Veda, a rock band from Dayton, Ohio, with folk and blues influences, which debuted in a concert at Wright State University’s Rathskeller. The group eventually performed live for Wright State’s Battle of the Bands at the Ervin J. Nutter Center, on a stage once graced by Cher, Lynyrd Skynyrd and others. Other than Benson on vocals, Burning Veda featured Michael St. Christopher McLain on lead guitar, Zach Hohenstein on rhythm guitar, Mandy Jewell on bass, and Tim Amrhein, formerly of The Crotch Rockets, on drums. Various other friends/guest musicians also stood in on bass and guitar through the life of the project. 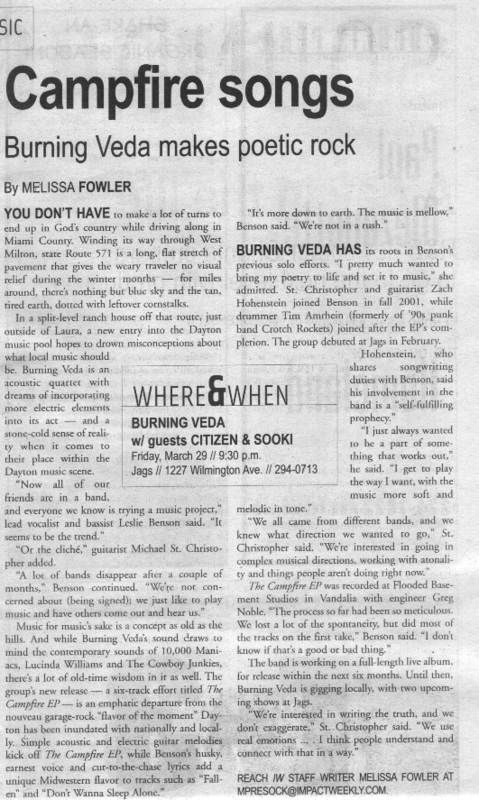 Burning Veda played its final show together during the 2002 Dayton Band Playoffs at the Canal Street Tavern. That same year, Benson won the Mudrock student writer’s competition for her original song, “Love in the Same Way,” about embracing diversity. She then took a seven-year hiatus from music to focus on her career in journalism. Listen to The Campfire EP on Musical Family Tree.